You can now obtain a new copy of the second edition of the HortiDaily & FloralDaily greenhouse guide. This new buyer's guide is fully updated and expanded with even more contact details of greenhouse constructors, screen installers, energy experts, seed suppliers, breeders, consultants and all other companies for your horticultural supplies. Whatever you need, wherever you need it, you can find it in this book! 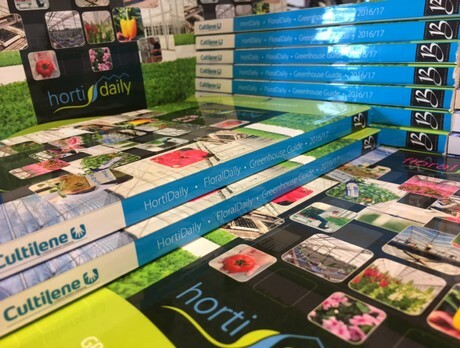 In total, 7,500 copies have been printed, available free of charge at a key selection of international horticultural exhibitions that the HortiDaily and FloralDaily team will attend. The copies can be picked up at a HortiDaily booth, or one of our editors attending an exhibition can help you to get a free copy. Where to obtain a free copy? At some shows we will have a booth, to others we're attending we will bring a few. Let us know if you need one and drop us an e-mail at eelkje@hortidaily.com to arrange your copy. Can't make it to one of these shows? No worries, because it is also possible to ship you a free copy for a 25 USD/EURO postal fee, please e-mail eelkje@hortidaily.com to arrange this. Are you a supplier and missing your company listing in the Greenhouse Guide? No worries, a third edition of the the Buyers Guide is coming up in 2018. E-mail us at eelkje@hortidaily.com to include your listing.